The lure of the Big Green Bus is calling and you’re ready to discover one of the most beautiful countries around. But first you want to figure out exactly how Kiwi Experience works and what is included with your bus pass? Walk this way friends. From booking to budgeting here’s the low-down on a few of our most commonly asked questions. Booking - which pass should I book? We’ve got a solid lineup of bus passes, each with their own quirky names and subtle differences. Now’s the time for a little research to figure out your game plan, NZ must-do’s and pick out the right pass. Once you’ve mastered NZ geography 101, the differences between passes start to make more sense. The Whole Kit and Caboodle covers our entire route, Funky Chicken hits all the the major players, while Super Funky also makes sure you get to “8th Wonder of the World” Milford Sound. From there you’re a few clicks from buying your pass online - bonus points if you manage to score one of our special deals. Once you’ve purchased your pass and figured out your travel dates, let us know what date you want to get on the bus so we can reserve your seat. Even if last-minute is your middle name, it’s a good idea to book all your buses in advance - especially in high season (December - March). The buses fill up quickly in summer, making advance booking the best way to secure your travel dates. Budget - How much money do I need? Some of the best things in life are free. Then there’s skydiving… And bungy jumping, glacier climbing and jet boat rides. All those hard earned quid, dollars or rupees will definitely come in handy. So how much cash should you expect to splash? - If you’re happy bunking it up with your new found friends, you’ll be looking at around $30-$35 per night for a bed in a dorm room. - If cosiness is key, most hostels we use have double rooms for about $80 (for two people). Discover the beauty of a steak and cheese pie, or fuel your avocado toast habit. Tasty food stops abound on the Kiwi Experience route. - Allow about about $20 a day for food. Slightly less if you’re feeling thrifty, or up that budget if a daily flat white is on the menu. - For the budget conscious self-catering is definitely the name of the game. - We stop off at supermarkets along the way so you can keep fuelled for cheaper. Pak n Save will quickly become a fave, Kiwi’s low cost supermarket. In an ideal world this is where you’d allocate 100% of your budget. In the real world it’s probably going to be anywhere from 40 - 80% of your budget, depending on how many adrenaline fuelled, jaw dropping moments you squeeze in. - Paid activities start from as little as $20, and go all the way up to $500+ if you’re looking to spend some serious cash. A day of ‘flightseeing’ with Air Safaris has to be one of the most spectacular ways to blow the budget. - The Kiwi Experience App has a full price list. - Our awesome value activity packs will get you a tidy discount if you want to pre-purchase our best-sellers. Accommodation - Where do we stay? We guarantee your first night’s accommodation in all of our overnight stops. Adventure charged days are even better with Kiwi Experience; you can rest easy (literally) knowing we’ll sort you a bed each night on the route. We’ll even drop you off at the doorstep. We partner with great hostels around the country that provide comfy, clean and reasonably priced digs. Their dorm rooms are the most social and economic way to go. If you’ve got a buddy then double rooms are an option where available. 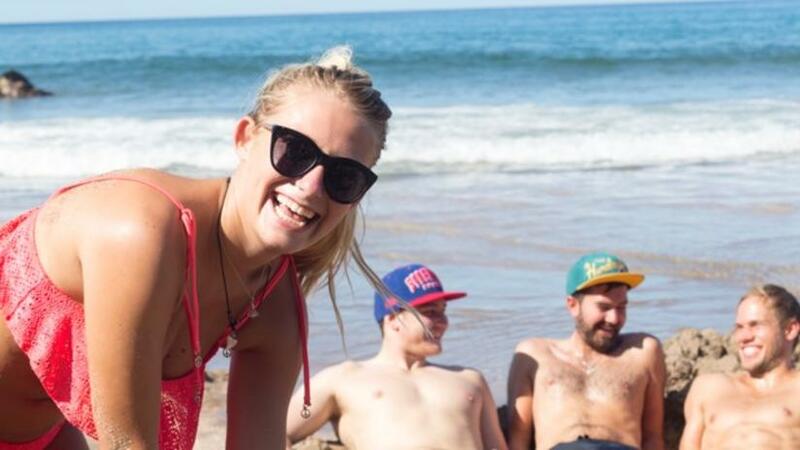 Base and Nomads hostels pop up around the country, plus for certain stops we offer unique accommodation options. If you want to sort out your own accommodation that’s completely fine with us. Your driver will usually stop at a few key spots in each overnight stop so you’re not lugging your bags too far. From December to March accomodation can get pretty booked out. Either sit smug and go for our guaranteed accommodation - or get organised and book in advance! Trip Length - how long do I need? How long is a piece of string? If you’re asking us it’s anywhere from a very short 13 days to a nice lengthy 12 months. Two Weeks: Two weeks around New Zealand and you’ll get in a decent chunk of the top spots - but you’ll be travelling at a pretty high speed without much time to soak it all in! One Month: With one month in the country you’ll be able to properly hit all the best bits, plus have a little time to jump off the bus for a few extra days here and there. 2 - 3 Months: If a more chilled 2-3 months is on the cards you’ll be able to take it all in at your own pace. With plenty of time to jump on and off where your heart desires, hike, get off the beaten track or maximise your time in backpacker favourites like Queenstown and Paihia. 12 Months: If you’re on a working holiday visa and have a whole sweet year to check out Aotearoa, you’re in luck with our bus passes being valid for 12 months. A mix of work and travel might be on the cards. Once it’s time to hit the road, book your seat on Kiwi, enjoy the ride and jump off again once ready. Repeat, repeat, repeat until 12 months is up! We suggest a minimum number of days needed to complete each pass here. Remember to count in an extra night for arriving and departing New Zealand: jet lag and check-in times are very real and unavoidable. Kiwi Experience Inclusions - What’s included in my pass? 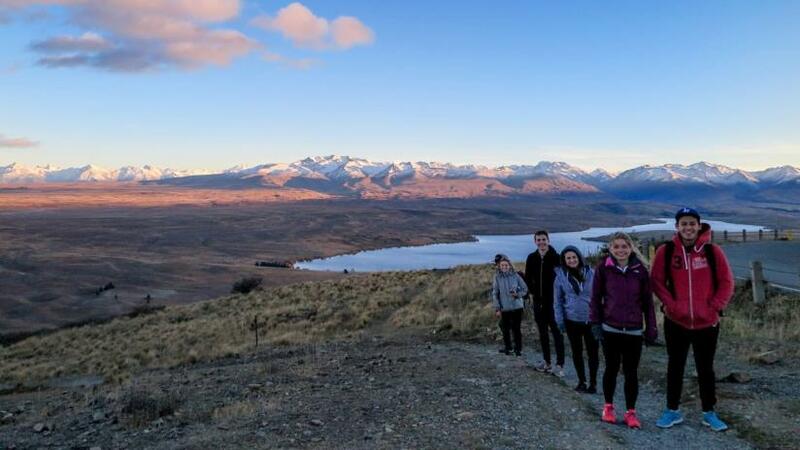 So much more than a bus tour, you’ll quickly figure out what make Kiwi Experience legendary. Secret spots and amazing photo-ops only locals know about, combined with great vibes and the very best driver guides, we pack a whole lot in with your bus pass. Ultimate Driver Guide: your go-to guy/ girl, there to make your trip as awesome (and easy) as possible. All while serving up some of the most informative and entertaining commentary around. Talented multi-taskers, they can also book your activities and accommodation for you. Walks: get ready for some spectacular strolling. We’ll take you to some stunning walks along the route - waterfalls, cliff-top coastlines and lush forest all included! Photo-ops: for the best insta snaps look no further. Our driver guides know exactly where to get the best angle, with plenty of stops to jump out of the bus and give your camera a slice of the amazing scenery. 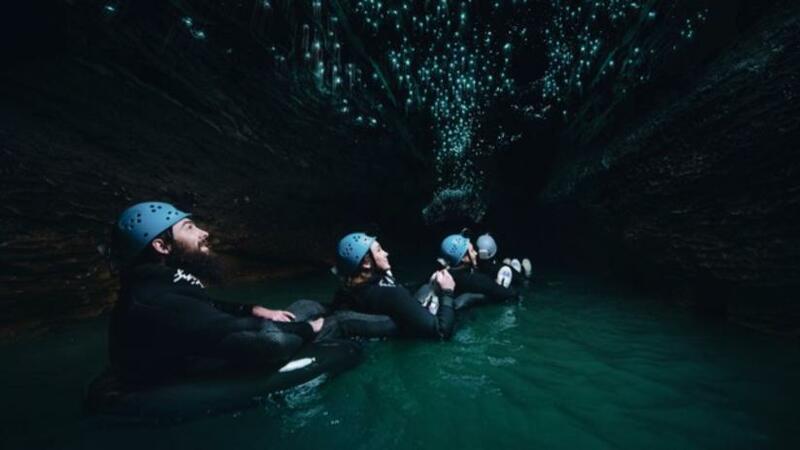 Exclusive activity discounts: working with some of the best activity operators, we secure great deals exclusive to Kiwi Experience passengers. Black Water Rafting, bungy jumping and Tamaki Maori Village are just a few of the spots where booking with us gets you a discounted rate. All this, plus a whole bus of like-minded travellers (and plentiful advice on where to head if you’re after a good night out) make it the ultimate pass for an epic trip. Along the route there’s some unique overnight stops where we’ve sorted out accommodation in amazing places. A mix of must-do attractions and hard-to-find places, these are extra special overnight stops. Hot Water Beach Holiday Park: one of the world’s best beaches (according to Lonely Planet), dig a hole in the sand for your own private spa pool under the stars. 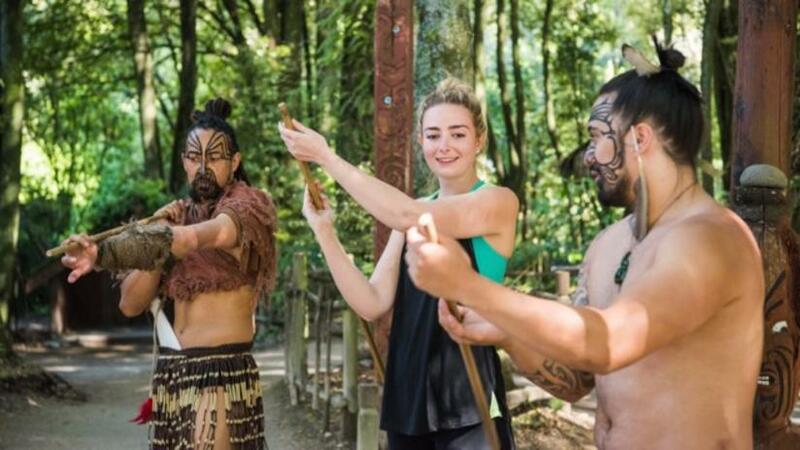 Tamaki Maori Village: consistently ranked as one of New Zealand’s top cultural attractions. Maori Culture with a delicious hangi feast and traditional whare accommodation. River Valley Adventure Lodge: slightly in the middle of nowhere, rafting, horse riding and a whole lot of epic scenery is River Valley’s drawcard. 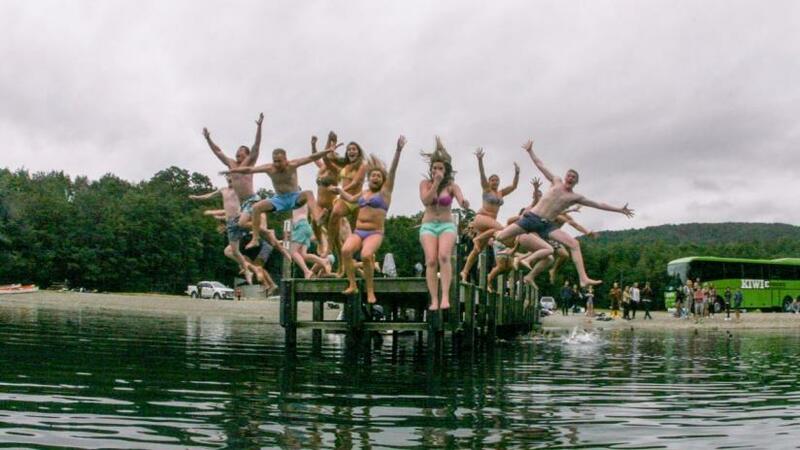 Lake Mahinapua Hotel: the world famous ‘Poo Pub’. Hosting Kiwi Experience’s dress-up party for over 25 years, get your costume and dancing shoes ready. 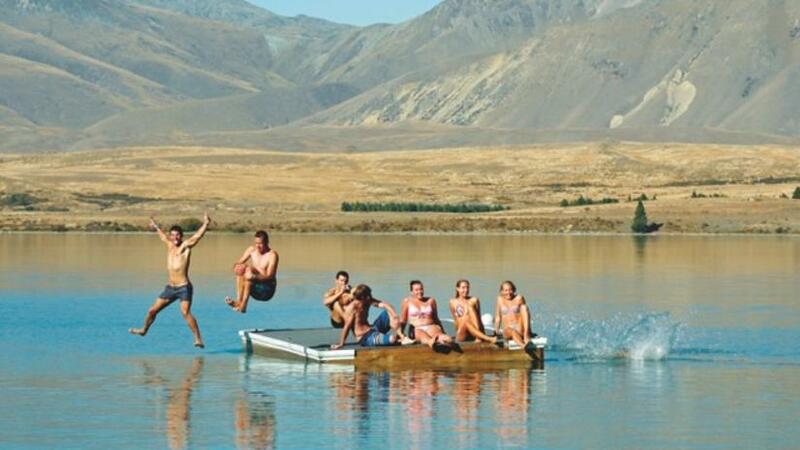 Lakefront Lodge Lake Tekapo: stay lakefront at one of the most picturesque and Instagrammed spots in the country. Hop-on, Hop-Off - What’s the bus timetable? All about the freedom of the road and a bit of spontaneity? We hear ya. 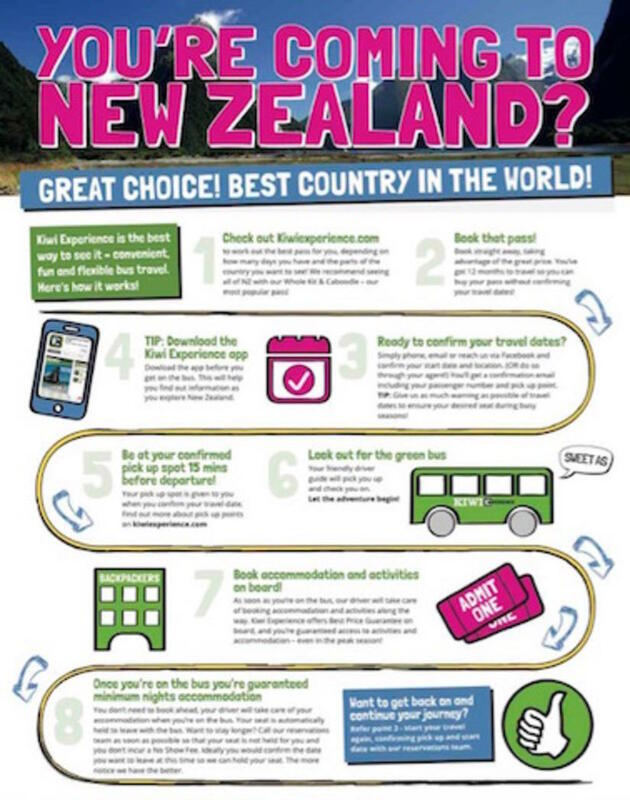 That’s why Kiwi Experience is hop-on, hop-off, making your trip around New Zealand a lot more flexible than a fixed tour. If you’re feeling like one or two nights isn’t going to be enough for some overnight stops you’re free to stay longer. Just make sure to tell our team and they can switch around your dates. In the summer months most stops have buses arriving and leaving everyday. In winter we run slightly fewer buses meaning that most stops will have 3-4 departures per week. We’ve always got bus timetables available a fews months in advance, so you can figure out what’s going to work for you. 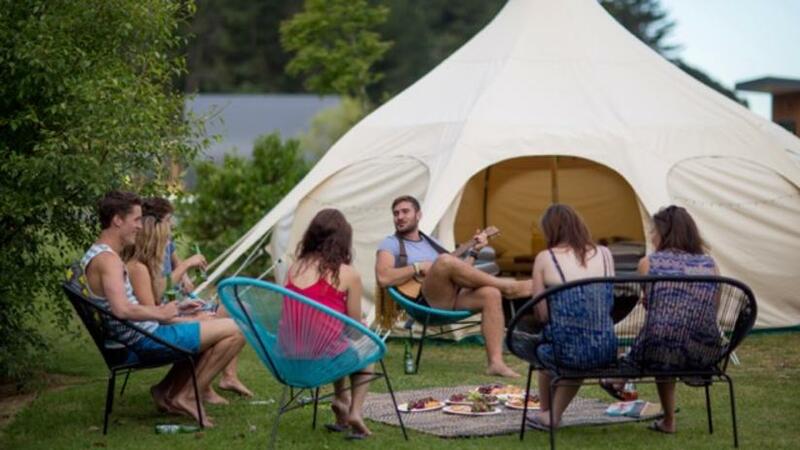 Got your Kiwi Experience game plan sorted? Pick your pass here!